I wander around my unusually clean kitchen, killing time before I get to pick up my son from the airport. He has just finished his freshman year in college, and something that feels like relief floods my nervous system. I haven’t seen him in two months, so I try to imagine what he’s going to look like standing on the curb outside American Airlines. He’ll probably need a haircut, and 50/50 he’ll be wearing pajamas. We have different ideas about what counts as appropriate attire for air travel. I take two sticks of butter out of the refrigerator as I try to imagine how tired he is. Freshman year in college is an exhilarating exercise in problem solving. There are standard things like Calculus and term papers, and more complex things like wanting to sleep but having to get yourself up for class. You run out of time, food points and clean socks. You figure it out. There is so much newness to absorb, new people, new germs, new geography; I’m exhausted just thinking about it. I pre-heat the oven to 350 degrees before I realize that I’m making cookies. I grab sugar and flour, and then oatmeal. Regular chocolate chip cookies seem wrong for this day. They are icky, like a too-wet kiss. Oatmeal cookies feel like sustenance, a solid hug of support. There’s a chance I’m overthinking this whole thing. When the cookies are in the oven, I find myself on my hands and knees searching the back of a cupboard for a small oval tray that I haven’t seen in years. It seems like the right size for the welcoming, small enough to feel like the cookies are just for him. When I find it, it’s tarnished, so I polish it with what look shockingly like my mother’s hands. I remember coming home from my own freshman year in college. 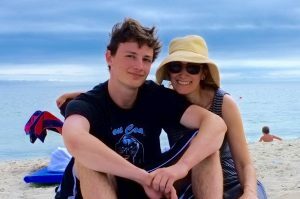 In fact, it was the same college my son is returning from. I felt different, and not just because my clothes were so tight. I felt like I’d accomplished something, even if that thing was just having gone away and survived it. The tension in my shoulders released when I got off the plane in Los Angeles. Here was a place where people knew me and where I knew what was around most corners. We got on the freeway, not the highway, and passed In and Out Burger. Everything seemed to be right where I left it. When we got home, I wanted to collapse. I knew my bed would be soft and the right size. I knew that if I sat on my mom’s sofa, I’d sink into it. The whole place felt like it was enveloping me in a welcome. 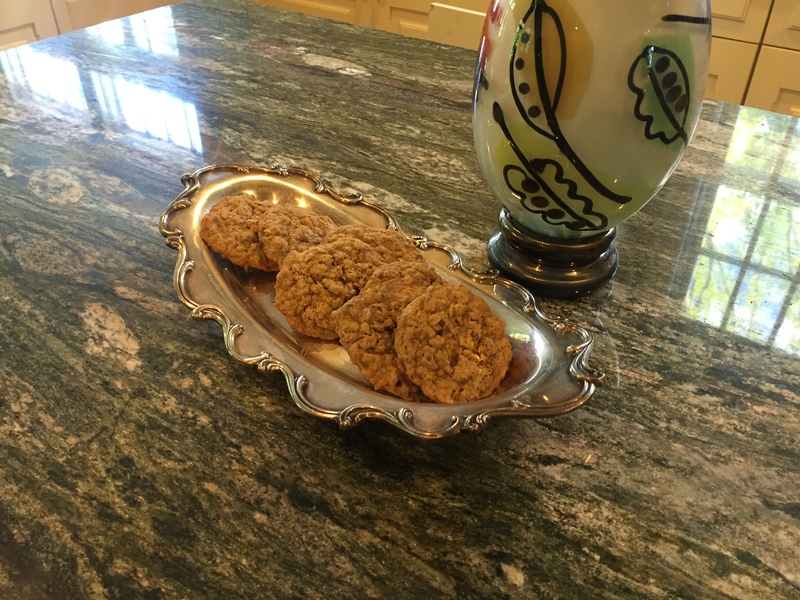 And on the coffee table was a small oval tray with just exactly the right number of oatmeal cookies. 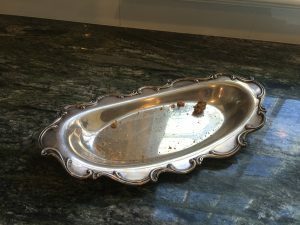 This memory nearly knocks me over as I’m polishing my mother’s tray with what look like her hands. I hadn’t thought about those cookies in 30 years, but here they are filling my kitchen with the moment I was trying to recreate. I don’t remember if I ate one of those cookies or if I even said thank you. But the thought behind them must have registered with me. It’s nice to think that, in the dusty corners, we file all that good stuff away.